Coffee is one of the most popular food and drink products in the world, and we consume over 400 billion cups annually. Despite decades-long controversy on the health properties of coffee, the current consensus is overwhelmingly positive. In fact, the latest research shows many exciting health benefits of drinking coffee. This article looks at 15 of these benefits and examines how this popular drink affects our body. Operating with a clear, focused head is never easy first thing in the morning. For this reason, many people enjoy a cup of coffee to wake themselves up and to get their mind working for a day at the office. Interestingly, research shows that there is a correlation between coffee consumption and occupational performance. In particular, alertness, attention, and reaction time all improve following low to moderate doses of caffeine (1, 2). Perhaps this is one reason why many companies provide free coffee to their employees! You may also know that coffee contains caffeine, a psychoactive chemical that has stimulant effects. An average-sized cup of brewed coffee contains approximately 95 mg caffeine, an amount shown to boost focus and concentration levels (3, 4). Key Point: There are many benefits of a morning coffee, and these include better focus, concentration, and productivity. Alzheimer’s disease is a progressive, neurodegenerative disease that causes a slow decline in memory and cognitive function. It is devastating to sufferers and their close friends and family. However, just like other chronic diseases, there are many aspects of our lifestyle that can increase—or reduce—risk. Notably, recent research hints that coffee consumption is one factor that may help us avoid Alzheimer’s. Although the evidence we have is not currently conclusive, it is “substantial” and coffee consumption is likely protective against mental deterioration (5). In fact, there was a recent systematic review and meta-analysis on this very topic. The study’s results demonstrated that in a total of 29,155 participants, there was a “significant inverse association” between highest coffee consumption and Alzheimer’s disease (6). Therefore, as well as coffee making our mornings better, it may help protect our cognitive health in the future too. This could be the most significant health benefit of drinking coffee. Key Point: Studies consistently show that coffee reduces the risk of Alzheimer’s disease. At this time, this is not a proven fact – but the evidence is significant. You may not know caffeic and chlorogenic acid, but they have some very positive effects on human health. For more on chlorogenic acid, see this guide here. Caffeic acid is a hydroxycinnamic acid – a kind of plant chemical believed to have health-protective properties. It is one of the most concentrated polyphenols in coffee, and you can read more about its chemical structure here. On the positive side, researchers believe this compound offers anti-inflammatory, anti-aging, antiviral, and anticancer abilities (7, 8). Furthermore, recent studies on both compounds demonstrate some interesting benefits too. These beneficial features include enhancing the immune system of asthmatic children and protecting the liver from toxicity in animal studies (9, 10). Additionally, clinical trials are investigating the compound as a possible treatment for esophageal cancer (11). Despite this, we shouldn’t read too much into these potential benefits just yet. 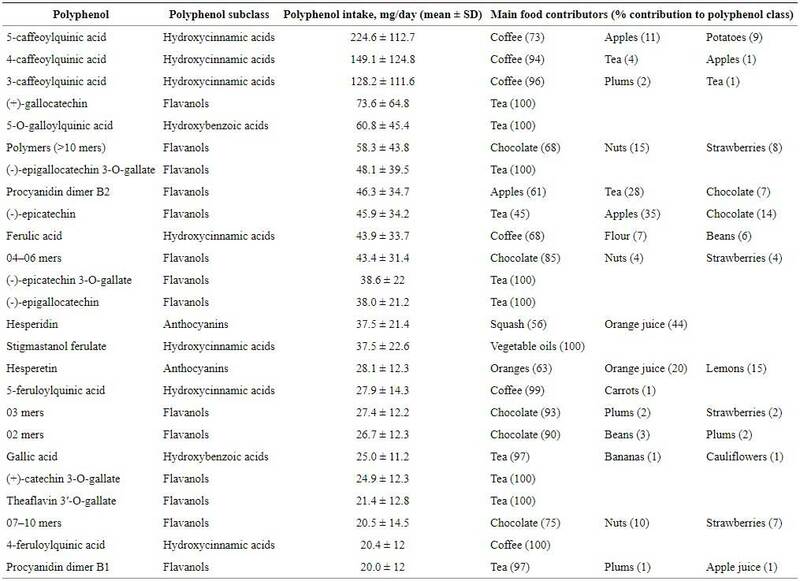 For one thing, we have to bear in mind that these studies use more of the compound than what naturally occurs in coffee. 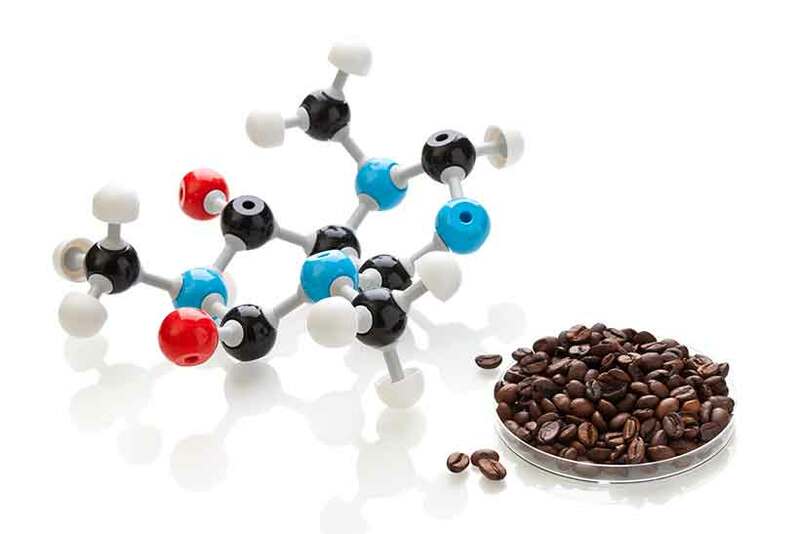 Key Point: The caffeic acid content is another potential health benefit of drinking coffee. Current understanding suggests this polyphenol has a range of health-protective properties. While many skin cancers are relatively mild in nature, melanoma is the exception. This skin cancer is often fatal, and prevalence rates are quickly rising across the world. However, unlike the popular narrative, sunlight alone is not the only risk factor. The food we eat can significantly increase—or decrease—our risk of burning and developing skin cancer. On this note, several studies show that coffee may protect against melanoma. The mechanism of action here is likely that the polyphenols in coffee help to increase the UV resistance properties of our skin (12). Two recent systematic reviews demonstrate that a higher consumption of caffeinated coffee lowers melanoma risk at a “statistically significant” rate (13, 14). Key Point: Coffee appears to have benefits for our skin too – regular coffee drinkers may have a lower risk of melanoma. As we discussed in the prior two points, coffee contains various polyphenols. However, it is worth noting that coffee is one of the biggest providers of these compounds in the world. In fact, some research suggests that coffee is the most significant dietary source of polyphenols in the American diet (15). Markedly, a range of studies shows they help to boost immunity and protect against age-related decline and inflammation (16). This polyphenol content is one of coffee’s major health benefits, and all coffee contains these compounds, whether instant or freshly brewed. Key Point: There are many advantages of drinking coffee, and the drink’s polyphenol content is undoubtedly one of these. 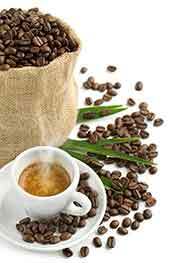 Coffee is possibly the largest source of dietary polyphenols in the world. A further potential health benefit is an association between drinking coffee and a lower risk of stroke. First of all, correlation does not equal causation. 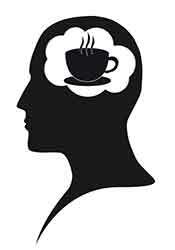 However, countless studies in this area all suggest that coffee reduces stroke events (17, 18, 19). A Korean study of 146,830 individuals found that high coffee consumption (>3 cups per day) lowered stroke risk by 38% compared to non-coffee drinkers. A meta-analysis of 9 high-quality studies showed that those who drink >4 cups of coffee per day have a lower stroke risk than drinking <1 cup. Results from a systematic review of 11 studies featuring over 479,689 participants demonstrate that coffee mildly reduces stroke risk. That said, not all the studies on this topic are positive. On the negative side, one statistical analysis shows that the risk of ischemic stroke rises in the first hour after drinking coffee – especially among irregular coffee drinkers (20). Despite this drawback, the bulk of the overall research on coffee lowering stroke risk is very positive. Key Point: Coffee may help to prevent stroke. When you look at the numbers, perhaps they are right. For instance, 30.3 million Americans are living with T2D, and an additional one-third of the population has prediabetes. In other words, over 100 million Americans have a prediabetes or type 2 diabetes diagnosis (21, 22). It only gets worse. As of 2014, 422 million people worldwide suffer from the disease. Back in 1980, it was only 108 million (23). As always, prevention is better than cure, and there are many strategies we can use to reduce our T2D risk. Along with cutting out refined carbohydrates and simple sugars, coffee appears to provide some health benefits in this area too. A systematic review of cohort studies—featuring over 1,247,387 participants—found that higher habitual coffee consumption is associated with a lower risk of type 2 diabetes (24). A further systematic review was undertaken that looked at studies between 1966 and 2013. Markedly, there was a clear and consistent inverse association between coffee and type 2 diabetes in a dose-dependent manner (25). However, don’t think of coffee (or any food) as a magic bullet. While coffee may offer some benefit, the best way to avoid type 2 diabetes is a good diet, exercise program, and adequate sleep. Key Point: A reduced risk of type 2 diabetes appears to be another health benefit of drinking coffee. Note: this means black coffee, not lattes or sweet-flavored drinks. While coffee contains many different compounds, some of the health benefits relate to one in particular — caffeine. One randomized, controlled study demonstrated that 400 mg of caffeine per day clearly increases insulin sensitivity (26). A review of the existing evidence suggests that caffeinated coffee consumption lowers the risk of Alzheimer’s, Parkinson’s, and cardiovascular disease (27). A broad systematic review of caffeine intake and potential adverse outcomes was undertaken in 2017. This particular study showed that while there are benefits, there are no adverse health effects at consumption levels of up to 400 mg per day. This figure translates to approximately four cups of coffee (28). To sum up, caffeine appears to have various positive impacts on our body. However, some negative effects start to appear when we consume more than 400 mg – these effects become more prevalent in a dose-dependent manner. Key Point: In moderate amounts, caffeine helps improve concentration and lowers the risk of several chronic diseases. On the other hand, just like most things – excessive amounts can be harmful. Some more positive effects of drinking coffee include its potential hepatoprotective properties. First of all, “hepatoprotective” is a word that means something can prevent liver damage. As a result, discussions have suggested coffee as having a potential role in the treatment of chronic liver diseases, including non-alcoholic fatty liver disease (NAFLD) – a condition which processed food fuels, and it is rapidly rising in prevalence. In a systematic review, evidence suggests that coffee consumption may protect the liver from damage in non-alcoholic fatty liver disease (NAFLD) and lower the risk of metabolic syndrome (29). A systematic review examined coffee consumption and liver diseases. This review found that coffee consistently improves lab readings, reduces mortality, and improves overall survival. The authors state that for those with liver diseases, physicians should encourage daily coffee consumption (30). A randomized, controlled trial demonstrates that coffee has a protective effect against chronic hepatitis C. This trial showed that coffee consumption reduces oxidative damage while increasing telomere length and apoptosis rate (31). Key Point: Coffee has various hepatoprotective properties, and regular consumption improves a wide range of symptoms relating to liver diseases. An increasing number of studies show coffee has an association with increased longevity. A delicious drink that makes you feel better and live longer? It sounds too good to be true, and again – correlation does not equal causation. However, research shows that there is an association between coffee consumption and lower mortality. Two of the biggest ever studies were recent multi-national and multi-ethnic cohort studies involving over 700,000 participants. Among 185,555 participants of multiple ethnicities, higher coffee consumption—both caffeinated and non-caffeinated—was associated with a statistically significant lower risk of death (32). In 521,330 participants from 10 different countries, those in the highest quartile of coffee consumption had statistically lower all-cause mortality. The relationship was consistent and did not vary by country (33). These impressive results are likely due to the health-protective bioactive compounds that coffee contains. Key Point: Improved longevity could be the biggest health benefit of drinking coffee. We should never assume association equals causation, but there are strong associations between coffee and a lower risk of mortality. Is coffee good for your heart? The research on coffee and heart-health hasn’t always been consistent. However, there has never been any evidence of harm in otherwise healthy people. 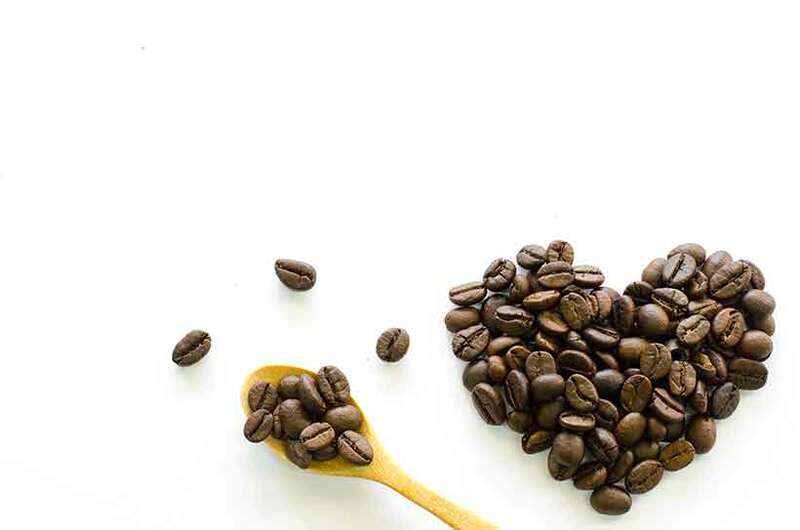 On the contrary, the Framingham Heart Study found that caffeinated coffee consumption is associated with a lower risk of CVD mortality and disease progression in the elderly (34). In recent years, accumulating research suggests that coffee likely exerts several health benefits relating to heart health. In an analysis of 36 studies involving 1,279,804 participants, those drinking 3 to 5 cups per day had the lowest CVD risk (35). Another review found that—in moderate doses of up to 4 cups oer day—coffee is safe and likely holds a benefit in reducing CVD mortality (36). A further meta-analysis of 21 studies featuring 997,464 participants also shows promise. In particular, the research shows that coffee consumption has a cler inverse relationship with cardiovascular mortality (37). However, more coffee isn’t necessarily better. 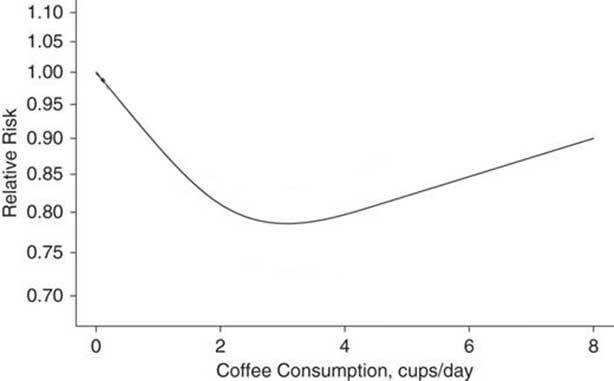 For instance, there appears to be a ‘U’ shaped curve with coffee’s protective benefits. A few cups appear to benefit heart health, but increasing consumption over 4-5 cups per day may have an adverse outcome. In short, sensible consumption of coffee may be ‘heart healthy’. Key Point: Multiple systematic reviews and meta-analyses suggest that, in moderate amounts, drinking coffee has heart benefits and lowers cardiovascular risk. A further health benefit of coffee drinking is the positive effect it appears to have on depression. Put shortly; coffee drinkers are less likely to suffer from depression. A systematic review of 23 existing studies demonstrates a clear, significant relationship between coffee consumption and lower rates of depression (38). Additionally, a meta-analysis of studies involving 330,677 participants found evidence of a dose-response protective effect against depression. Notably, the risk of depression decreased by 8% for every additional cup of coffee per day (39). This effect seems understandable when we consider the positive impact on mood, energy, and focus a cup of coffee seems to bring. Key Point: There is consistent evidence that coffee has a beneficial effect against depression. It seems that coffee also has benefits for dental health. 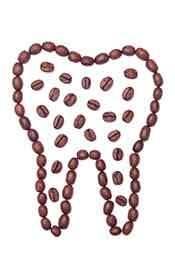 Research suggests that coffee contributes to oral health through protecting against periodontal disease. 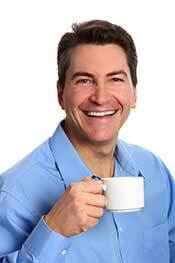 One particular study showed an inverse relationship between drinking coffee and severe periodontitis (40). Furthermore, a study of 1,152 dental patients found that higher coffee consumption correlates with a small but significant reduction in periodontal bone loss (41). Additional research hints that coffee may have antibacterial and anticaries properties when consumed by itself (42). This means black coffee, and not drinks like bulletproof coffee or sweet flavored drinks. Key Point: Does coffee help keep our teeth and gums healthy? Possibly, but avoiding sugary food and drinks should always come first for dental health. Coffee’s energy-giving properties are widely known, and they come down to the caffeine content of the drink. On this note, coffee can play a role in improving physical sporting and exercise performance. For one thing, studies show that drinking coffee before a workout can help enhance recovery, increase resistance training load, and boost our metabolic rate (43, 44, 45). Also, a systematic review of 21 studies investigated these claims in relation to endurance athletes (46). The researchers found that caffeine ingestion of approximately 3-6 mg per kilogram of bodyweight had performance-boosting effects. To put it another way, the amount of caffeine to benefit a 70 kg individual would be somewhere between 210 and 420 mg. In real-world terms, this is equivalent to one or two Starbucks grande size coffees. These benefits were variable between different studies, with performance improvements being somewhere between 0.3 and 17%. However, it’s important to remember that caffeine is a drug and it can have some strong effects. Key Point: Prior to exercise, caffeine consumption helps to improve sporting performance. A further positive of coffee is the protective effect it seems to have against cancer. While the mechanism of this effect is unknown, it seems reasonable to suggest that coffee’s ability to lower insulin levels and reduce inflammation plays a role. For one thing, both of these are classified as likely factors in the development of cancer (47). So, just how much of a protective action does coffee have against cancer? Compared to a low coffee intake, the highest coffee intake may reduce the risk of oral cancer, pharynx cancer, colon cancer, liver cancer, prostate cancer, endometrial cancer, and melanoma by a respective (48). A meta-analysis of 40 prospective cohort studies found no negative effect from coffee. However, the study did find that coffee lowers the risk of bladder, breast, pancreatic, and prostate cancer among others (49). However, this inverse relationship doesn’t show for all types of cancer. For instance, a recent systematic review investigated coffee’s impact on colorectal cancer incidence. In this study, the evidence was insufficient to support that drinking coffee increases or decreases risk (50). Key Point: There is reasonably strong evidence to suggest that coffee may help lower the risk of some cancers. How Many Cups of Coffee Should You Drink Per Day? 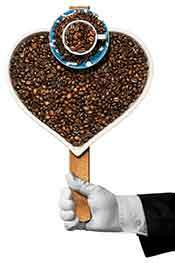 If you tolerate coffee well, then the sweet spot appears to be somewhere in the 3-4 cups per day range. Like with most things in nutrition, we are all unique as individuals, so go with whatever seems to work the best for you. Overall, there’s every reason to suggest that a daily coffee has several positive health benefits. Drinking Coffee Every Day: Good or Bad? Butter in Coffee: Is It Really Bulletproof? Instant Coffee: Is It Good or Bad For You?